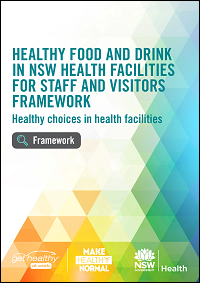 The Healthy Food and Drink in NSW Health Facilities for Staff and Visitors Framework ​provides best practice guidelines to increase the availability of healthy options to make the healthy choice an easy choice for our staff and visitors. Eating too many unhealthy options and not enough healthy foods and drinks is a major contributor to over half of adults and one in five children in NSW being overweight or obese. As a health service provider, NSW health needs to set a good example. The Framework will assist relevant managers in NSW Health facilities to make healthy food and drink normal in NSW Health facilities by March 2019. Removing sugary drinks with no nutritional value from sale is a key component of our healthy eating initiative.